White Collar Crime in Georgia--A Blog By The Goolsby Law Firm, LLC. 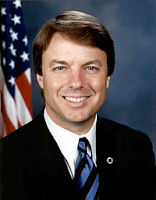 (706) 863-5281: The John Edwards Verdict: Hot Off the Press! Have you heard the news about the jury verdict in the John Edwards criminal case? According to news reports, Edwards has been acquitted on one count and a mistrial, (based on a hung jury), has been declared on the remaining counts of the federal indictment charging him with trying to conceal alleged campaign contributions to his secret lover, Rielle Hunter. It is unclear at this juncture as to whether or not the federal prosecutors will attempt to re-try the former Senator on the mis-tried counts. Please recall that I had predicted in this blog that Edwards would be found not guilty!